Winter walkways can be dangerous, but slips, falls and slides are not the only concerns pet owners should have about icy paths. Different ice melt chemicals may seem to create a safe walking surface, but those chemicals can be even more dangerous to pets than any ice. Understanding how ice melt can affect your pet's paws and the other problems these chemicals can cause can help you take the proper steps to keep your pet safe and sure-footed all winter long. There are many different ice melt products available, with different chemical compositions, but nearly all of them contain large quantities of salt. The exact salt may vary – sodium, calcium, potassium and magnesium chlorides are some of the most common options, but they are not the only choices. Other chemicals may also be part of the melt, and even so-called "pet-safe" melts aren't necessarily as safe for pets as manufacturers proclaim. These products are largely unregulated and untested, and there is no telling exactly how safe different ice melt chemicals may be for different types of pets. The best option is simply to keep your pet away from all of these chemicals. Pets can come into contact with ice melts in different ways. When they walk across treated surfaces, pets can pick up chemicals on their paws or on any long fur, and they may get more chemicals on their fur if they lay or roll on a treated surface. When your pet licks their paws or grooms their fur, they can ingest the chemicals. 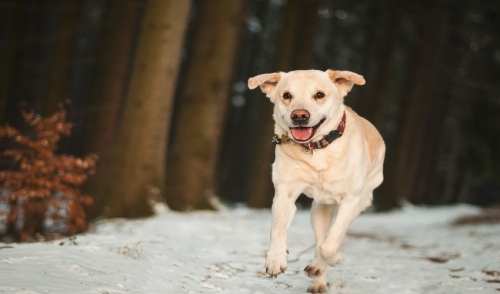 A thirsty pet might even eat snow or drink water contaminated with chemicals. Even when ice melts aren't in use, a pet might accidentally get into stored products, with dangerous results. The exact reaction a pet may have to ice melts can vary. The amount of product the pet has come into contact with and the composition of the product will affect how pets react to the potentially toxic chemicals on their paws. When a pet walks through ice melt chemicals, their paw pads can get dried out and may even blister, burn or crack painfully. Because the pads are less flexible when dried out, they are less useful for traction on slippery surfaces and do not provide good insulation for the feet, increasing a pet's susceptibility to cold. Left untreated, a pet that has ingested ice melt chemicals may even fall into a coma or the exposure could be fatal. If your pet shows signs of ice melt contamination or you suspect the animal has ingested these dangerous chemicals, contact your veterinarian or emergency pet care facility immediately. There are several steps you can take to keep your pet safe from ice melt chemicals, no matter how icy the winter may be. Use chemicals as little as possible, and use them only as directed. Consider non-chemical alternatives, such as sand or wood ash, to grit a slippery surface. Shovel frequently so ice does not build up on pathways and chemicals are not needed. Never use chemicals near popular pet areas, such as in a pet run or kennel area. Walk or exercise pets in areas where chemicals have not been used. Wipe your pet's feet with a damp cloth to remove chemicals after coming indoors. Keep floors clean and boots out of reach of pets to prevent spreading chemicals around. Consider getting socks, booties or boots for your pet to wear outdoors. Store ice melt chemicals safely out of reach of pets at all times. Wash treated surfaces in the spring when the chemicals are no longer needed. By understanding how ice melt affects your pet's paws and how to keep your pet safe, both you and your pet can enjoy a comfortable, contamination-free winter no matter how much ice may accumulate.